Do you know how to benefit from IET Knowledge packs? Engineering practitioners and those involved in research and development all need access to relevant information from a trusted source, to enable quicker and better-informed decision making. 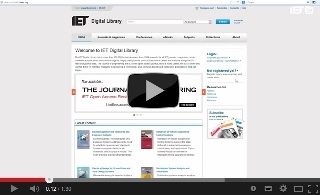 KnowledgePacks are credits designed to allow individuals to buy and download individual articles or chapters of content from the IET Digital Library which contains 190,000 technical documents, including nearly 450 eBooks, over 1,600 conference publications, hundreds of real life case studies and over 70,000 journal articles. KnowledgePacks give quick and easy access to unique, premium engineering & technology content online, enabling to you support your professional development, offering excellent value for money, allowing you to keep up to date with industry trends and developments; find, explore & discover the best, most current and authoritative research and analysis in engineering and technology and save research time through accessing and acquiring only content that’s useful and relevant to you. The breadth and depth of our content means that we can offer something to support any requirement. Use your KnowledgePacks today and discover your Essential Engineering Intelligence. One download is a single article or chapter. Non-members will need to purchase a Knowledge Pack to begin downloading. Don’t worry about running out, as IET members can buy additional packs of 25 credits for just £25 (excl. VAT) per pack, a significant saving on the non-member price of £75 (excl. VAT) per pack of 10 credits. When purchasing a Journal article, Book chapter or Conference article you'll see the option to purchase a Knowledge Pack. Select 'Add to cart' and go through the checkout process. You will then be able to purchase the publication using one of your credits. Simply click 'Use credit', click on the confirm button that will pop up and the content will then be accessible straight away. You will need to save the PDF to your computer within 48 hours, after 48 hours the PDF will no longer be available for download. This pop up box also give you information on how many credits you have remaining. You'll also be able to see this by clicking on your 'My Account' link and selecting 'View Credits'. This will allow you to see how many credits you have remaining and when they expire. When you're running low on credits an automated email will be sent to you, reminding you to top up. Credits must be used within a year of being purchased.